On Friday, Mayor Jim Kenney and city officials, joined by activists and immigrant rights organizations, announced the decision to end the contract which allows ICE access to the city’s arrest reporting system. The City of Philadelphia will no longer share the Police Department’s Preliminary Arraignment Reporting System (PARS) with federal immigration officials, to take effect when the current contract with ICE expires on Aug. 31. Mayor Jim Kenney, along with City Solicitor Marcel Pratt and Office of Immigration Affairs Director Miriam Enriquez, announced the decision on Friday to a jubilant crowd of advocates for the immigrant community, including delegations from Juntos and the New Sanctuary movement, who have been pushing for the termination of the PARS contract since it was first established in 2008. Mayor Kenney said he has known “from the beginning” that the PARS agreement should and would not be renewed in order to extend Philadelphia’s “welcoming city” policies, but it was a matter of time to determine the optics and politics behind such a decision, as the city could face backlash from the Department of Justice (DOJ) for its refusal to cooperate with ICE. The DOJ’s move to withhold much-needed criminal justice funding from the city due to its immigrant-friendly policies was declared unconstitutional by U.S. District Court for the Eastern District of Pennsylvania Judge Michael Baylson on June 6 — but the decision could still be appealed. Kenney said that though he “never wanted to be part of” the PARS contract, the city had to work to ensure that the decision to end the contract with ICE fell within the legal boundaries of the federal court ruling which affects not only Philadelphia, but all cities nationally. "This city is not an extension of ICE." To justify the end to PARS, the mayor and city solicitor detailed their findings that local ICE officials had been inappropriately using the database to target individuals - such as witnesses or victims to crime and those who self-report that they were not born in the U.S. - despite the fact that these people were otherwise law-abiding residents. This was a term of the PARS agreement, established between the city and ICE to ensure that law-abiding, undocumented immigrants living in Philadelphia continue to report crime to the police without fear that federal immigration officials would use their information to make assumptions about their documentation status and act upon those suspicions. According to the mayor, ICE officials pulled non-criminal suspects from their homes and cars, and in one case, interrogated a detainee, asking him to provide the names of 10 other undocumented individuals he knew of. Kenney said that ICE “rather than allay, in fact confirmed” many city residents’ concerns that the agency was using the information to enact immigration enforcement against otherwise law-abiding residents, as well as racially profiling people whose information they had access to in the PARS system, using the database to identify suspects by only their last names and country of origin. Pratt said the Philadelphia ICE Field Office also did not respond to city officials after it asked the agency to provide additional information on how it uses the database, and why the contract with the city should be renewed. “The termination of the PARS contract is the right decision. It’s a decision that will once again reinforce to our immigrant communities that this city is not an extension of ICE,” Enriquez said. An emotional Miguel Andrade of Juntos wiped away tears after the announcement. Andrade stressed that the end of the PARS contract is not the end of the struggle to make Philadelphia a safer city for immigrants. “Mayor Kenney is doing the right thing here in Philadelphia, now we’re looking to Governor Wolf to take the right step and do what he can and that is shutting down the Berks Detention Center as well,” he said. Blanca Pacheco, a co-director of the New Sanctuary Movement, said that her organization and others have been fighting to end the PARS contract since during the Obama administration, when former Mayor Michael Nutter refused to meet with them. Missing from the advocacy organizations credited for taking action against the PARS contract, however, was the Occupy ICE encampment, which Mayor Kenney said had “minimal” influence on the city’s decision-making process. 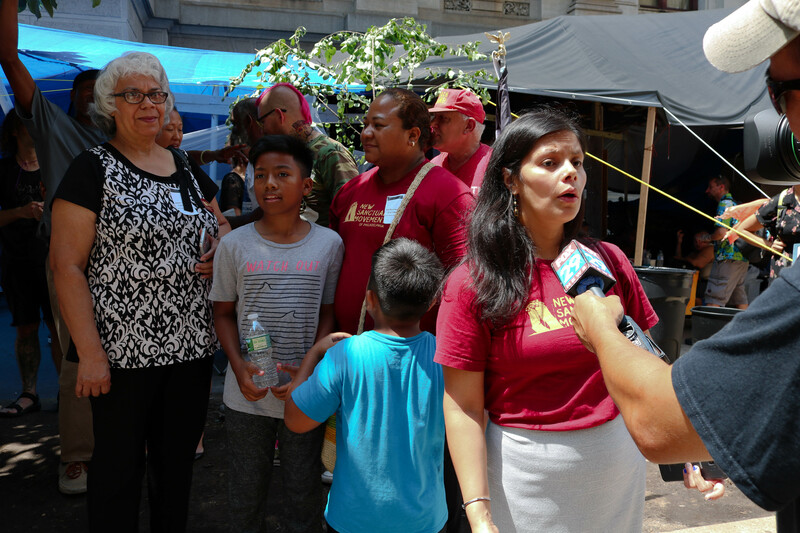 Organizer Xelda Gutierrez said that the movement knows their role has been to demonstrate as allies of the immigrant community and draw attention to them and the issues they face. 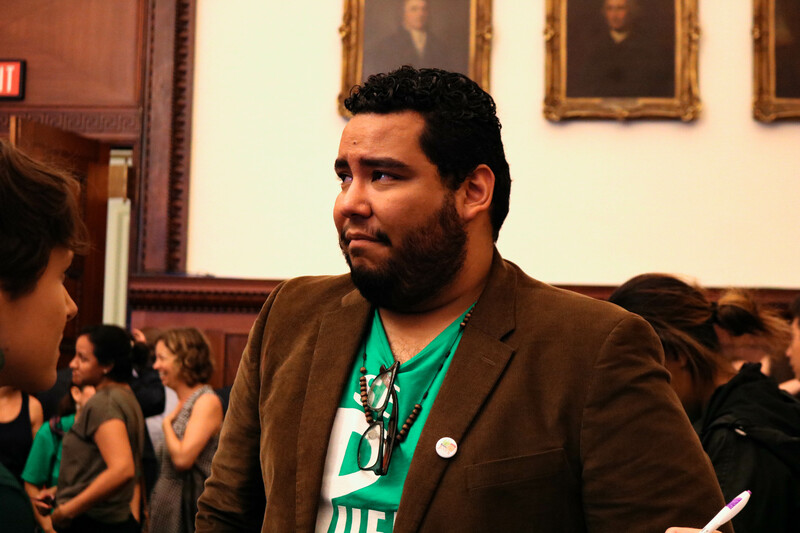 A delegation of three members from the Occupy ICE movement still met with the mayor on Friday after his announcement to end PARS. The next goal for the Occupy ICE movement and advocates for the immigrant community is the shutdown of the Berks County Residential Center. Gutierrez said the movement will push Mayor Kenney to make a statement to Gov. Tom Wolf denouncing the center, which is one of the only locations in the country where immigrant families are detained. Mayor Kenney did mention the Berks County Residential Center as a threat to the immigrant community in his announcement, but did not publicly call for an end to the detainment center. “Undocumented people are not criminals. They are in violation of some civil regulation, but they’re not criminals. And certainly their children aren’t criminals,” the mayor said. “You can’t just throw a wide net on people to decide who to send to Berks County, who you’re going to deport, who you’re going to arrest ... you can’t run a city like this,” he concluded to a round of applause from those gathered at City Hall.